We felt the organization of our content, units, and pacing wasn't as solid as we would have liked last year. To ensure a better organized year of instruction and a more cohesive experience for students, we decided we needed to use a single program to sequence the year but to use all the best math lessons we have used to enhance that program. We decided to use Math Expressions as the core for sequencing and pacing but to structure lessons so there is a balance of practice from ME but the bulk of time is spent on rich investigations. Kim had great success with her students teaching the multiplication and division units in Investigations. 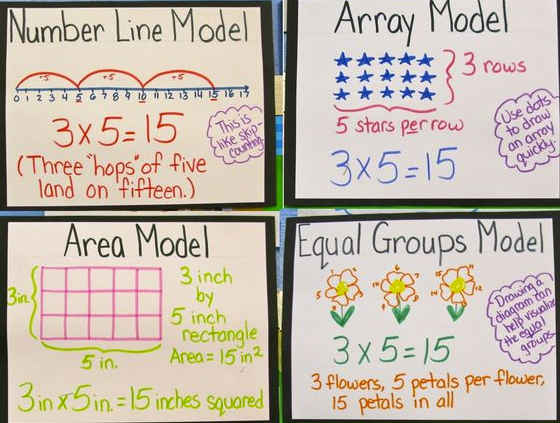 While we know the major work of third grade is multiplication and division, we have noticed students needing more time focused specifically on subtraction as it seems to get overshadowed by other concepts. We set a goal of devoting multiple weeks in the beginning of the school year to building procedural fluency with subtraction. However, given our decision to pace with the Math Expressions units (see notes below), we will probably need to start with multiplication and division, building in addition and subtraction experiences until we get the the full unit (ME Unit 4). We also set a goal of connecting with the 2nd grade team to talk about where they left off. We planned to look at the Marilyn Burns Extending Place Value book for some ideas. There are also a worthwhile collection of experiences for addition and subtraction of multi-digit numbers in Investigations Units 1 and 3 as well as Math Expressions Unit 4. We decided that we will introduce fractions earlier this year as there were more fraction problems on the CASSPP than expected. We wanted to remind ourselves that the number line/open number line is crucial. It connects to elapsed time and line plots with fractions, both of which were important on the CASSPP. We felt we should build in 15-20 minute mini-lessons throughout the year making sure all applications of the number line are comfortable for students. After the CASSPP, we felt students need more opportunities to encounter non-routine math situations at a DOK3 level. They need more opportunities where perseverance is necessary. We thought that increasing our use of the Math Journals from K-5 Teaching Resources would be a good starting place. We will be on the look out for more complex problems that students have to make sense of and engage in a constructive struggle to solve. The team wants to be more strategic about building in SBAC-type problems daily so they are familiar when the test comes around. Students need to get comfortable with "waterfall" problems, where you need to get each part correct to answer the next question. If you make a mistake on any part, all the calculations from that point forward will be incorrect. The team also wanted to give students experiences regularly with complex problems requiring critical thinking about scaled pictographs and line plots. The problems need to be embedded in a context. Being able to answer questions such as, "Data shows that students in our class read 15, 30, or 45 books. What scale will we use in our pictograph?" Students need contextualized experiences with line plots where they take data, measured to nearest quarter inch/mile etc. (ex: rainfall), and place it on a line plot, then answer questions about it. In 2018-2019 we are considering how the pacing plan for division below matches up to our online weeks - working on it.